Deacon Dr. Fresh Wine Newsletter: Creekside Rox the Deacon! World's Lurchest Wine Writer - The Gangsta of the Grape - The Sultan of Shiraz - The Buccaneer of Burgundy - The Prince of Pinot Noir - Yellow Tail's Bane - Locus of the Ladies' Focus - Wielder of the trousered Hammer of Thor - I have arrived to rescue the wine world from overly-serious, rigid, deconstructionist, rooster juice peckerwoods who'd never dream of gettin' a tattoo or crackin' a smile. 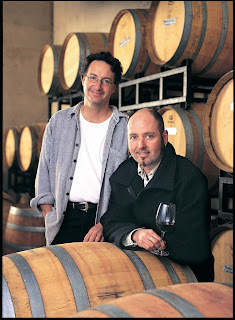 I am without a doubt, the smartest, funniest and toughest sumbitch in the entire wine industry. And I aint goin' away. All disputes will be settled bare-knuckled in the Octagon. You heard me. Oh, and by the way...Bite me crank! The Deacon Samples Some Lurch Lindemans Whites! Contest Update!!! You can still win tickets!!! Little Penguins, the Szabos and Brazilian Wax! The Deacon Interviews Stephan Moccio! The Deacon's fave Restaurants on the Road! Good morning Boyz and Girlz! Your Deacon here, with a much delayed article about one of my all time faves: Creekside Estate Winery! So let's talk about Creekside...By now, my lurchest fanz have realized that I cannot be frickin' bought. Your humble Deacon only supports wines and wineries that he believes in. I go out of my way to not diss people; although I'm not above neck-cranking them if they realllllllllly bug me. My strongest criticism is...silence. If I don't like something, I just ignore it - like a certain winery that would love to have the Deacon support the rooster juice they call wine; they want my imprimateur, but it ain't gonna happen... So in the past, I've written up the fine wines of Coyote's Run, Henry of Pelham, Cave Spring, Colio, Norman Hardie, Huff, Stratus, Penninsula Ridge, etc., because they all do a great job and make highly lurch products. What y'all got with Rob and Craig, is a highly effective team that brings diverse ("different" for those of you in Keswick) skills to the table. Former sommelier and Ontario boy, Rob, graduated from the first class at Brock University's Cool Climate Oenology and Viticulture Institute. Our local gunslinger is joined by the Wizard of Oz, Craig, who has worked at 9 different wineries around the globe. Now your Deacon has a lot of boisterous Australian friends, but Craig's the laid-back type, and isn't necessarily going to call you gay, just because you own a vacuum cleaner or occasionally help out with the dishes. It was my mentor, Billy Munnelly who introduced me to Rob and Craig as well as marketing wizard, Matt Loney, a couple of years back, and believe me, Creekside makes some fabulous stuff! Some of you will remember that I've been on a rant for sometime about how Shiraz will never do well in Ontario unless someone moves the earth closer to the sun, because Shiraz needs a lot of sunlight to develop fully. Well...I was wrong! But as usual, I admit to being wrong, which is always the right thing to do. So if you really think about it, that kind of makes me right after all, so get off my case and bite my wand! Creekside has made some Shiraz that's mindblowing! I don't know how they do it, and I aint axin', but one sip will convince you. Remember, this is a premium product. The 2005 Broken Press Shiraz is just incredible! The boyz use the time-honoured method of adding a splash of Viognier, which despite being a white grape, actually makes the wine darker and inkier. All the grapes come from their own vineyards at St. David's Bench. This'll run you just over 30 bucks, but it's worth every penny, and is the perfect bottle to impress that hot ho, so you can take her home for some boppin' in the beater! Zoltan gave it 4 1/2 stars out of 5, and that Hungarian knows his frickin' wine. Watch too for the 2006 Shiraz. Your Deacon hasn't tried it yet, but I've got every reason to believe it will be another killer. Another really lurch wine is Laura's Blend White. This is a mix of 6 white grapes, including Riesling, Chardonnay, Sauvignon Blanc, Pinot Grigio, Viognier and Muscat. The result is wonderfully startling! There are layers upon layers of complexity and flavours both local and tropical. They've just kissed it with oak too, instead of knockin' it dead with a sheet of frickin' plywood. This will run you about 18 bucks and deserves to be checked out. Typically, only Stratus' J.L. Groulx shows this kind of creativity, but Rob and Craig have stepped up to the plate and hit it out of the frickin' park! I could go on and on about this exceptional boutique winery, but you need to check it out yourself. You can visit their website and online store by clicking here. Y'all tell them the Deacon sent you, and say yo wassup, to my homey Matt Loney. He'll take good care of y'all. Congratulations Creekside, and thanks for keepin' it real. Greetings from the Empire State. I've tried Creekside wines and I must admit, they are yummy! Thanks for your awesome blog. I've started telling everyone I know to "bite my wand!" I'll pass your comments on to Creekside.